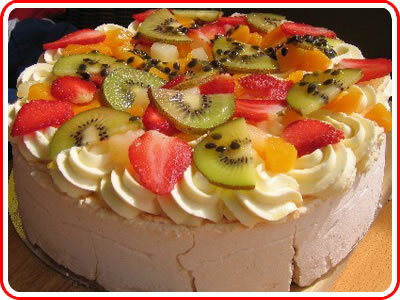 The iconic kiwi pavlova is a meringue-based dessert. It was named after the Russian ballet dancer Anna Pavlova. Pavloa is made by beating egg whites into a stiff mix. Caster sugar, cornstarch/cornflour, white vinegar, and sometimes vanilla are then mixed in and it is slowly baked to achieve a crunchy shell, but leaving the centre moist, soft, and marshmallowy (unlike a meringue which is crunchy all the way through). The pavloa is often decorated with whipped cream and various types of fruit (strawberries, kiwi fruit, banana, raspberry and passionfruit are all used in different combinations), and sometimes shaved chocolate is also added. First of all you need to beat the three egg whites together until they are stiff. Then add the castor sugar one spoon at a time, beating between each spoon. You then beat the mixture for at least 10 minutes. Then add the white vinegar, vanilla essence and cornflour, and beat until well blended. Coat a baking tin with a little butter, then line with baking paper. Add the mixture so that it sits in a "blob" about 8 inches wide (about 20 centimetres). Pre-heat your oven to 300°F (about 150°C). Put the mix into the oven and turn your oven down to 250°F (about 125°C) and cook for 1 hour. This next bit is really important. After cooking for 1 hour, turn your oven off and leave the pav in the oven until it is cold. This may take several hours, and encourages a good crust. 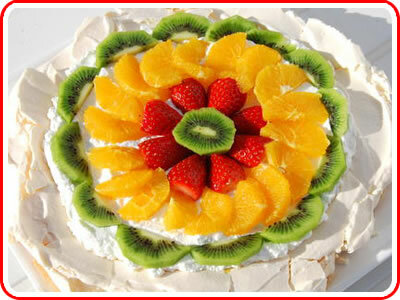 Before serving, decorate the pav in your choice of fruits and whipped cream. And that's it. A simple, delicious pavlova recipe. Enjoy.